When couples divorce, they will have to decide what to do with the family home. One option is to sell the home and split the proceeds. Alternatively, if one spouse wishes to keep the home, they will often refinance the mortgage in their own name and have the deed transferred. If one spouse intends to keep the home, it is important to have the property transferred properly, ideally before the divorce is finalized to avoid having to go back to court. The property should be quitclaimed and recorded, refinanced (or have another agreement put in place) to remove the non-owning spouse from the mortgage to establish sole ownership by the receiving spouse. Taking these steps not only benefits the receiving spouse, who will own the home free and clear, but also the transferring spouse who will have no financial responsibility to the home. If, for example, the transferring spouse simply removes their name from the deed and their name is still on the mortgage, he or she will still be liable for the mortgage debt. Failure to update the deed to reflect only the receiving spouse’s name will keep the tax liability in both names. It is far better to take care of these details during the divorce process to avoid problems down the road. 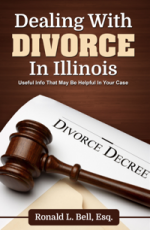 A thorough and knowledgeable approach to Illinois marital property division is key. Working with an experienced divorce lawyer will help you to avoid costly mistakes when dividing marital assets and debt in an Illinois divorce. Attorney Ronald L. Bell has over three decades of experience with marital property division in Illinois and he will make sure that you understand the process, your rights and what to expect as you work through your divorce. Schedule your consultation with Ronald L. Bell by calling 847-495-6000 or send an email using our online contact form.